Monarch Nucleic Acid Purification Kits are a new family of products utilizing a unique column design as well as optimized protocols and buffer systems for robust DNA cleanup and plasmid DNA purification. The kits are purposely designed to minimize environmental impact. In addition to the environmental considerations, the kits also offer several performance advantages, including a unique column configuration designed to eliminate buffer retention and carryover contamination. This design also allows for elution in smaller volumes, which facilitates direct use in downstream applications. 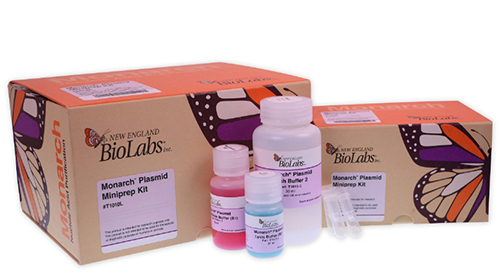 Monarch’s Kits are available for gel extraction, plasmid miniprep, and reaction cleanup. Buffers and columns can also be purchased separately.